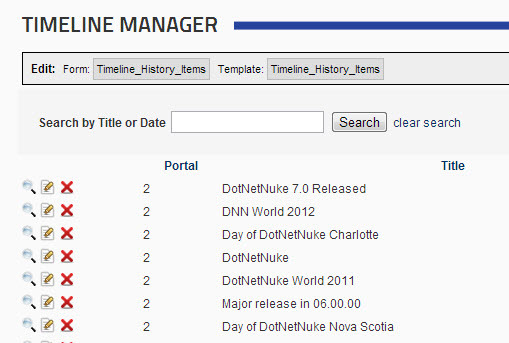 Uses: It can be used to show display any type of history or timeline narrative that is built from your JSON Feed. There is no fixed limit to the number of items in the history list, as the timeline will expand and organize events appropriately regardless of the grouping/legnth of timespan. As tips for great timelines, they recommend, "Pick stories [timelines] that have a strong chronological narrative. Include events that build up to major occurrences. Not just the major events." There are tons of features and extra things that you can customize in code... for instance, for data formats, the timeline can take either a JSON feed (the default we're using), but also a Google Docs spreadsheet cvan be used! Just use this google docs spreadsheet template. ALso, for demo purposes, the title timeline item (first element) is hard-coded within the XMP Feed. Make edits or remove from that location, all the while learning about XMP Feeds and how to setup a JSON feed! This XMod Pro Module Kit features an XMP Template for layout, a timeline list as a JSON XMP Feed, and XMP Form with admin-only editor view.